The setting for writing can vary depending on writing quirks. The ideal writing setting may be summed up in this photo. Once I tried writing at a lake cabin north of Amery, no distractions and no interference. Everything was there. But I had no ideas, no plan of what to write. That didn’t work. 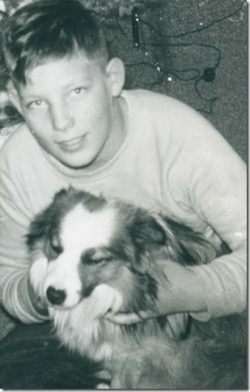 My writing as a serious hobby began at a summer class at UW-Madison in 1984. As teachers we were charged with coming up with ideas for our non-English classes to be writing friendly. At the time I was housed in an older dorm, one built in the 1920s, and the room was stark. Whatever I brought in my suitcase as well as a desk to work on and a single bed. That was the atmosphere, and it worked for me. 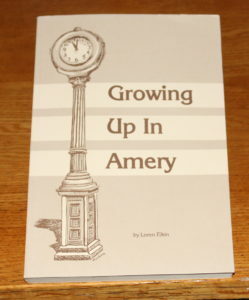 Some of the stories I later put in the book, Growing Up in Amery, were thought up and put together in that monastical room. 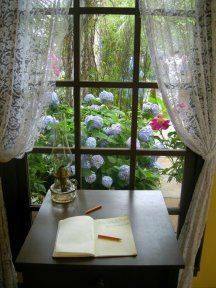 Often writing books will review the best writing spot, the best setting. That can vary depending on the person and what’s being written. For some a coffee shop or even a food court of a mall would be comfortable, that person not distracted by movement and noise and people. Another setting would be the quiet, as the above photo shows, where quiet reigns supreme and distractions are few. The scene above looks comfortable, lovely, and inviting. To some, looking outside would be a wonderful choice in times of thinking and taking a mental break. Other writers feel best when in a sterile environment, a blank wall in front of them. One author set up a writing desk and his computer in his basement, and entering that location would have nothing to distract. A concrete wall would be in his view, and for him the ideal writing situation. I prefer the scene above with a view to nature, and at times a library table with few distractions. For editing or even for listing topics to write about, a coffee shop or even a McDonalds eating area works for me. Sometimes when people I know stop to talk, it’s more than a stop. On a day when I went in with a small project to work on, a lady from church came in, plopped her items nearby, and said, let’s talk. And we did, chatting and comparing family stories, and it was 1/2 hour before she left. Not much done that day, but it wasn’t the end of the world; it was funny, in fact. Just recently available on Amazon as an ebook, the book below. It first came out in 1987, a collection of humor and memories which are a mixture of fiction and factual pieces. You don’t have to know AMERY to enjoy this book. The current price to place on your Kindle is 99 cents. Please try it if you’re an ebook reader. Atif, not sure what advice to give. There is Facebook and within that a person can make a weblog that is titled what you have written above. 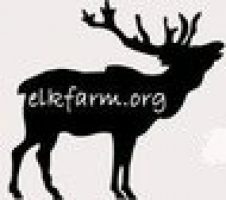 Go to FB and check under my name, I’ve got one called Elkfarm weblog fb or something like that, where I post a photo and a short description, shorter than I do on this site.